For lighting to be effective in a Dining Room, it should have the capability to set a relaxing, romantic mood, as well as a festive, holiday mood. 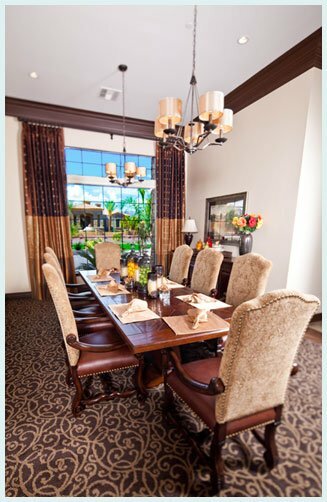 Highlight the dining room table as the focal point with a light fixture centered above. A dimmer switch is a great feature to incorporate into your lighting plan to allow for different occasions or moods. TIP: In addition to a chandelier above your dining table, add wall sconces, on either side of art work, collectibles, or niches. We also suggest using torchieres and buffet lamps for this feature to incorporate layers of light to your room, adding to a spectacular dining experience for you and your guests. For a distinct design statement, install a decorative ceiling medallion with your chandelier.